The solutions that 3DX-RAY will be showing include its unique portable FlatScan2 device and its SVXi small vehicle inspection system. 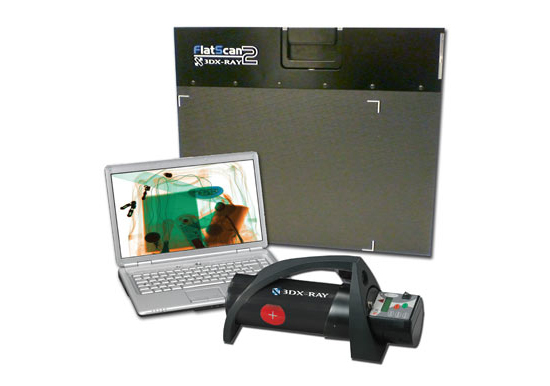 FlatScan2 is the world’s first portable x-ray device with 3D Ready imaging capabilities for improved inspection. The 3D imaging capability delivers significant benefits for security services by making an inherently ‘unnatural’ x-ray appear more ‘natural’, enabling the operator to correctly interpret a set of items as either benign or as a threat. In high pressure IED and EOD scenarios where x-ray images need to be analysed as quickly, reliably and safely as possible FlatSan2’s imaging delivers improved detection rates, reduced time to decision and much easier usability for security operatives. The SVXi small vehicle x-ray inspection system is a rapid deployment, mobile x-ray system that can be set up and operational in under ten minutes. As a result the SVXi system can increase throughput in a wide range of security applications such as Customs & Excise, public events and conferences and can also be deployed in EOD incidents to scan suspect vehicles. The system can produce a detailed x-ray image of an entire vehicle (up to the size of a transit van) with resolutions below 1mm, increasing the probability of detection and reducing false alarms. Vince Deery, Sales Director of 3DX-RAY, commented: “Terrorism, unrest in the Middle East and the growing intelligence of criminals remain dominant issues for national security organisations. With threats becoming more unpredictable and terrorists finding new ways to cause harm, the need for advanced technology that delivers flexibility and mobility are needed. Counter Terror Expo, the international exhibition for security professionals will be welcoming more than 400 companies and is expecting 8,500 visitors from within Government, military, law enforcement, emergency service, private sector and the security services sectors. The exhibition showcases a comprehensive range of solutions, developments and services that help to mitigate threats, protect against terrorist attacks and understand current modern day risks, in a secure environment. Visit us on Stand L14, Counter Terror Expo, Olympia, London.